These words embody the spiritual, cultural and historical relationship of Whanganui Maori with the river which holds their ancestry. This important whakatauki or saying traditionally used by local Maori has become increasingly relevant to locals of European descent whose lives and history have also become interwoven by the river as it travels on its journey to the sea. New Zealand’s longest navigable waterway begins high up in the volcanic plateau of the central North Island, an area of rugged, mountainous country west and south-west of Lake Taupo, and it drains the western slopes of Mounts Ngauruhoe, Tongariro, and Ruapehu. 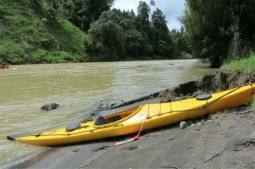 The river then travels north towards Taumarunui before heading south for 260km towards Wanganui. Its 329km journey to the sea passes through an endless procession of forested valleys and hills, the greater part of its length being deeply entrenched in a steep-walled gorge cut in soft, upper Tertiary sandstones and mudstones of the Whanganui National Park. Early Māori used the Whanganui River and its tributaries to facilitate trade and communication among themselves and as far as Wellington, Waikato, Taranaki, Taupō, and Bay of Plenty regions at least 600 years ago. Within the dense ngahere (native forests) of the Whanganui region, early Māori from Te Āti Haunui-a-Pāpārangi cultivated the sheltered terraces and built their pā on strategic heights. In time, the upper river became linked by a series of pā which are called ‘the plaited fibres of Hinengākau’. Every bend and rapid of the river has a guardian, or kaitiaki, who maintains the mauri (life force) of that stretch of the river. Whanganui hapū (sub-tribes) were renowned for their canoeing skills and maintained extensive networks of weirs and fishing traps along the river until the arrival of riverboats forced changes to customary practices. Generations of river iwi have learned to use and protect this great taonga (treasure). The arrival of European missionaries in the region in the 1840s saw the conversion of many people to Christianity and the establishment of chapels at villages along the river. Land sales and a consequent mistrust of authorities led many Māori to strengthen their links with the Pai Marire religion, which centred around traditional Māori beliefs. Followers of Pai Marire were also known as the Hau Hau, and two of their strongholds were Maraekowhai and Pipiriki. They conducted services around ‘niu’ poles, two of which still stand on private land at Maraekowhai.